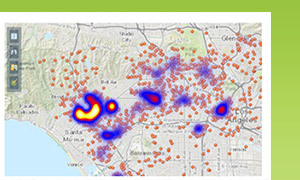 Create color-coded, clustered point, and heat maps to visualize key business measures such as sales and customers. Use configurable symbols to differentiate single points or groups. 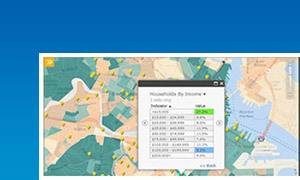 Enrich your map with Esri demographic and lifestyle data to get a deeper understanding of an area and its population. Add infographic pop-ups to communicate key data points in an easy-to-understand and highly visual way. You can also add external business data through Business Connectivity Services (BCS). 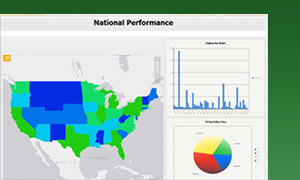 Analyze specific points or groups of points in the context of standard regions, including state, county, or Zip-level, or custom regions. Drill down from higher to lower level regions on your map, for example to compare sales by state versus metropolitan area. 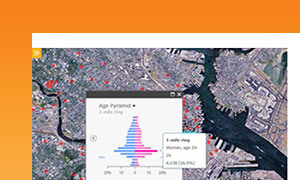 Share your maps through ArcGIS Online so decision makers and others in your organization can access them on any device or via a browser. You maintain tight control and can determine who can access and edit your maps. Esri Maps for SharePoint is available in 22 languages.